The Maples Course at Sea Trail is the oldest of the three Sea Trail courses. Designed by famed golf course architect, Dan Maples, the course opened for play in 1986. This Myrtle Beach golf course blends its natural beauty with Southern charm to create a fantastic Myrtle Beach golf experience. The lush fairways wind through towering Carolina pines as well as twisted ancient oaks and lead to recently renovated greens of A1/A4 blended Bent Grass. Beautiful natural marshland water hazards along with large waste bunkers make this a challenging but fun Myrtle Beach golf course. Five holes border the scenic Calabash Creek and offer some unique Myrtle Beach golf photo opportunities. The course measures 6,797 yards from the blue tees, 6,332 yards from the whites, 6,035 yards from the gold and 5,141 from the red tees. As on all of the Sea Trail courses, the Maples Course has an abundance of wildlife such as ospreys, herons, fox squirrels, fox, raccoon and large alligators. Please don’t feed the gators. 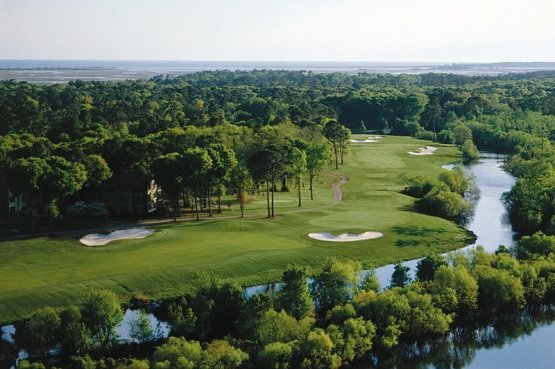 A Myrtle Beach Golf Authority golf package can include the Maples course with any of the outstanding Myrtle Beach golf courses that will satisfy even the most discriminating golfer. The wonderful North Myrtle Beach accommodations offered by Myrtle Beach Golf Authority such as North Myrtle Beach hotels, condos and ocean front beach houses will make your stay very memorable. The mild Myrtle Beach weather, spectacular golf courses and Southern hospitality are just waiting for you to book your Myrtle Beach golf package.